Reese’s is messing with us. The candy brand announced Reese’s Thins last month—who on earth wants less Reese’s?—but quickly reversed course this week to give people what they actually want: more Reese’s. See, Hershey’s Company, it’s not that difficult. But the limited-time promotional three-packs beg the question—why can’t we just have three-pack Reese’s all the time? I was content with two cups… until I realized there could be more. My mind boggles. USA Today brings us news of these more-Reese’s packs, which contain three rather than the standard two peanut butter cups. It’s a promotion tied to March Madness basketball brackets, in which the company notes three-seed teams have only a 3 percent chance of winning the tournament. This fact blew my mind, and I attempted to crunch some numbers this morning before realizing that actually, I care way more about peanut butter cups than college basketball. So, back to the Reese’s: Yesterday, Hershey’s gave away 70,000 free three-packs at the three-seed colleges, which are Purdue University, Louisiana State University, the University of Houston and Texas Tech University. Even if you don’t attend one of those schools, you have a chance to win a free three-pack by texting REESES to 604333. You’ll then receive a code, which you can enter online for a chance to win. 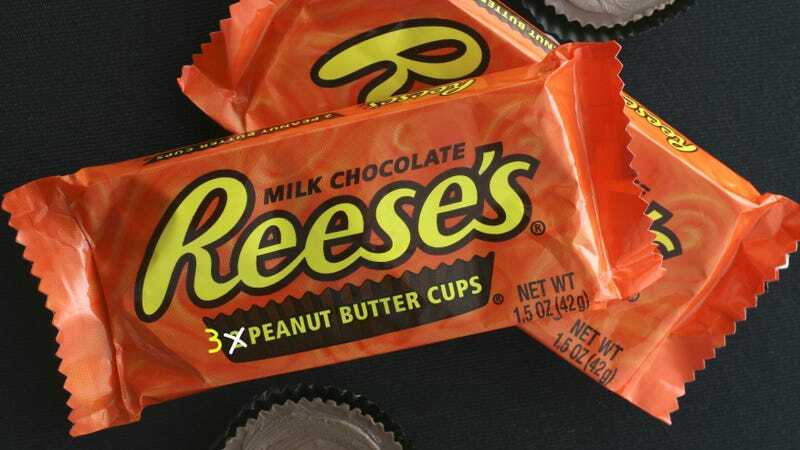 The three-cup packages will not be sold in stores, which is ridiculous, because if Reese’s has the capability to give us more Reese’s in a pack, they should. It would go a long way toward making amends for those stupid Thins.